The Department of Energy is in the midst of conducting a Quadrennial Technology Review (QTR) to be released in September of this year. Its goal is to “establish a context and robust framework for the Department’s energy technology activities” that will help the Department to “accelerate the transformation of the nation’s energy system to meet the challenges of energy security, U.S. competitiveness, and environmental impacts.” This reads like good, rational, and eloquent government speak. True, our energy system is undergoing a fundamental change. And nowhere is this change more profound than in the electric power grid: the continental-wide, behind-the-scenes engineering apparatus that transforms about one-third of the Nation’s energy sources into electricity. In fact, many of today’s policy priorities—renewable energy, plug-in hybrid electric vehicles, building and industrial energy efficiency, greenhouse gas reduction, and secure infrastructures—are predicated on having a reliable, efficient, and secure electric grid. Yet much of the current electric power infrastructure was designed decades ago for a very different economy and regulatory environment. Modernization of the electric grid is urgently needed to increase capacity, flexibility, and functionality; accommodate the two-way flow of electricity and information; and protect the grid from physical and cyber risks. 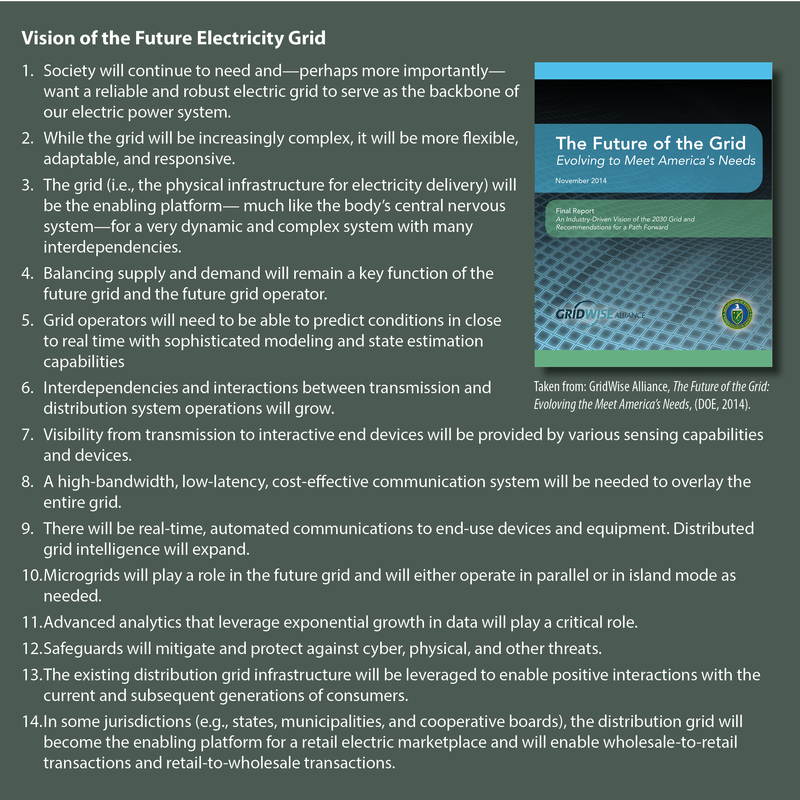 But what will the grid of the future look like? No one knows for sure. But under the direction of the GridWise Alliance and DOE, more than 240 thought leaders from utilities, regulators, state governments, renewable energy providers, vendors, consumer advocacy groups, and academia met during four regional workshops in 2013 to develop this vision of the future grid from now through 2030. To realize this vision, we must make research and development of enabling power grid technologies a top national priority. While advances in wind, solar, and other renewable technologies grab more of the headlines (and the federal energy R&D budget), it is a modern electric power grid that truly holds the key to achieving a clean energy economy. Using the vision outlined in The Future of the Grid, the QTR must identify the technology challenges and goals, technical requirements, and R&D gaps to move us forward.